It has been a long time since an update and a post of any significance to this blog, or for that matter, to any other social media outlet. 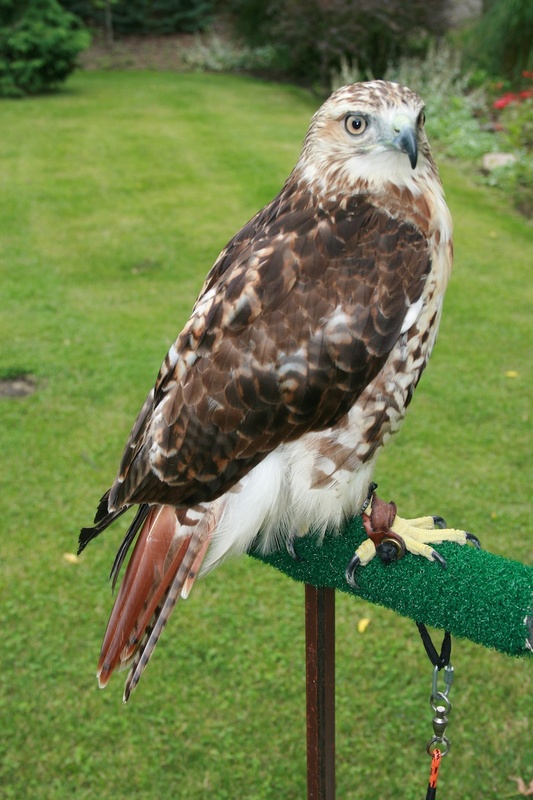 With the propensity for articles, pictures, sound-bytes, and posts to go viral, I never know when these adventures will get singled out by someone who has a polarizing opinion on the subject of Falconry. You just never know what is going to set someone off that will forward the post throughout the interwebs and have some warped opinion come out on the other end of it. With my experience with other falconry forums, NAFA Directors, and facebook trolls, I’m leery of posting anything remotely attackable. So, I’ll provide an update to a few choice projects and leave this here as a historical record of this summer. The moult for the summer is in full swing for both Sabre and Vesper. Daily chores continue to include keeping the mews clean and getting the birds some perch / air time out of the mews. Feathers continue to drop steadily and new feathers are growing steadily. Both birds are going through a wonderful transformation into their adult plumage and it is a privilege to witness up close. Kelly and I continue to build a new mews for the birds with Vesper as the eventual habitant. In addition, we expect to install a second chamber onto the first. It’s not an ideal setup, but we are making it work as best we can with the space and materials available. By the end of the summer, there will be room for 3 birds and the deck will be clear of the current mews. As a continued participating member of the MHC, the spring Apprentice Workshop was a huge success, pulling in folks from around the state. With the help of other falconers, the instructional team that puts on the workshop is top-notch with great stories and informative slide shows. 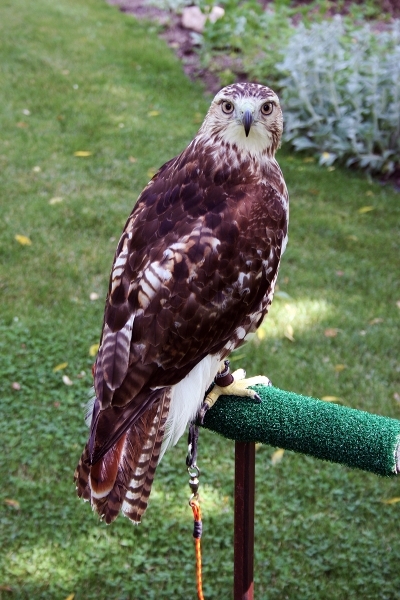 The Summer picnic is coming up at the end of July, so we’ll all meet again for another day of falconry fun in Lansing this year. Later on in the summer, we’ll go back down to Lake Erie Metropark for HawkFest. 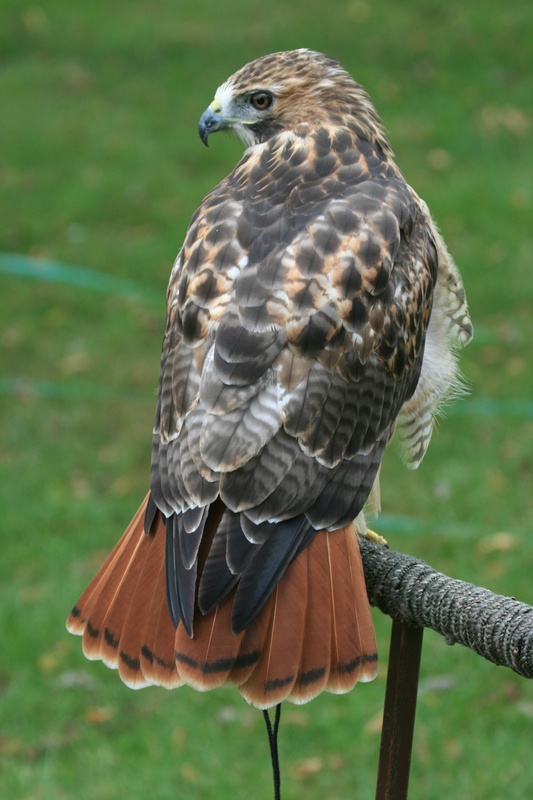 Then the trapping gets going and all of the fall falconry and hunting events is in full swing. 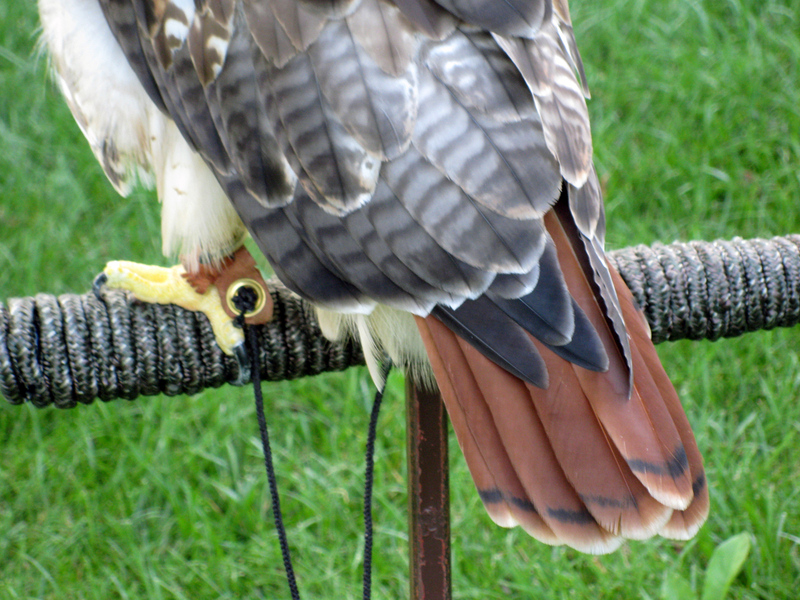 Cedar’s moult is progressing nicely this summer as the warm months continue to bless us with great summer weather. Cedar is doing very well, enjoying her mews and attention that she gets when we are out working in the yard. I got this picture the other day to show off her “Big-Girl” feathers. Well, here we are at the end of September. Hunting season is just around the corner and Tahoe’s feathers are in prime condition for another hunting season. I recently sent this photo to a friend of mine who remarked: “Wow, is that the same bird?” and the answer of course, is “yes.” Tahoe has moulted all her feathers and the process seems to be complete. There are less feathers in the mews this week and the only feathers that constantly appear are the small, white fluffly down feathers, which seem to continuously shed anyway. She is quite magnificent now with her dark wings, bright tan-orange front, and her stunning red tail. Looking forward to a second great hunting season!